Mladá Boleslav / Shanghai, 10 April 2019 – ŠKODA intends to continue its success story in its most important single market by entering the E-Mobility sector, which is growing rapidly – particularly in China. At Auto Shanghai 2019 (16 to 25 April), ŠKODA will be presenting the VISION iV and the KLEMENT concept bike, thus unveiling its dynamic, innovative and sustainable vision of the future for the Chinese market. The booming SUV segment has further growth potential. 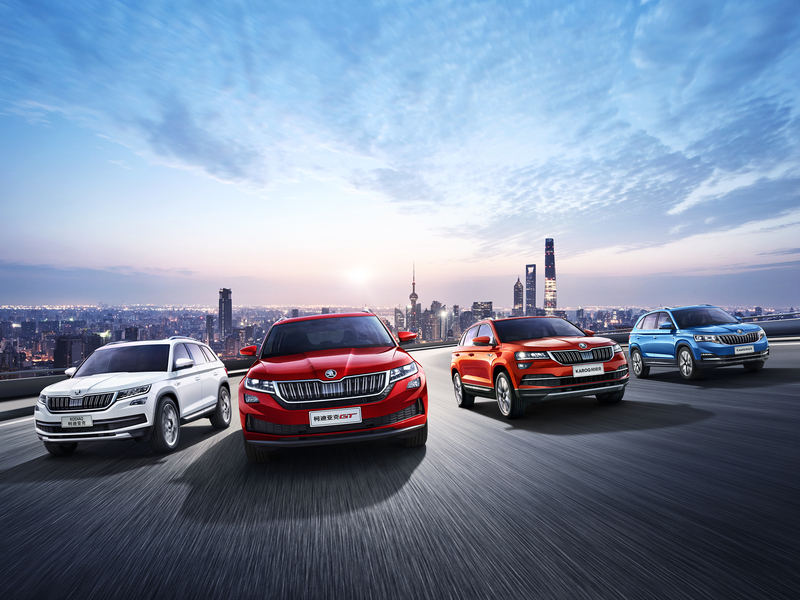 China is the only market in which ŠKODA offers four different SUV models – the top-model ŠKODA KODIAQ GT, the ŠKODA KODIAQ as well as the ŠKODA KAROQ and ŠKODA KAMIQ. 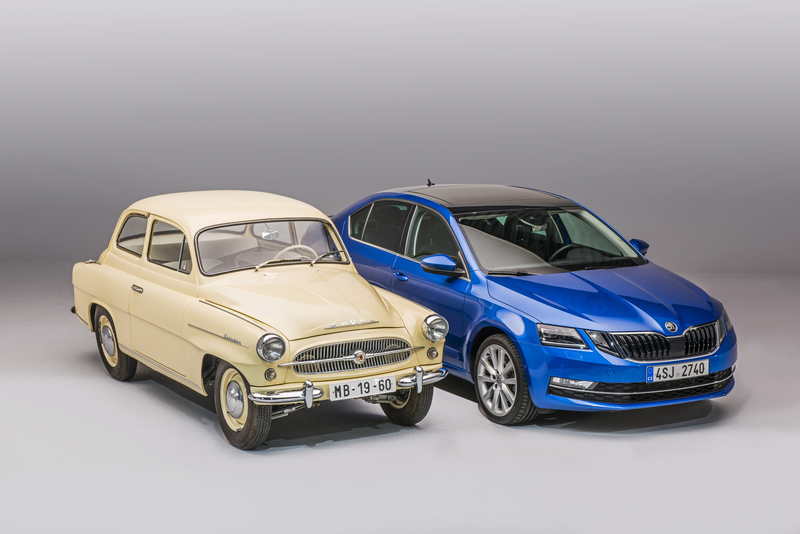 In celebration of the first OCTAVIA turning 60, ŠKODA will be displaying its legendary model range from 1959 at Auto Shanghai. At this year’s AUTO Shanghai, ŠKODA is presenting itself electric, innovative and sustainable. With the VISION iV and the KLEMENT, ŠKODA is offering exciting prospects for an electric future. Furthermore, the car manufacturer will also be showcasing its entire SUV family: the ŠKODA KODIAQ GT, KODIAQ, KAROQ and KAMIQ. The VISION iV offers specific outlook on the series electric car. The brand’s first all-electric model to be based on the modular electric car platform will be launched in Europe in 2020. In consultation with the joint venture partner SAIC VOLKSWAGEN, intensive work is already being carried out regarding entry into the Chinese market. At the same time, ŠKODA is to continue its steady growth trajectory there, primarily with models in the SUV segment. 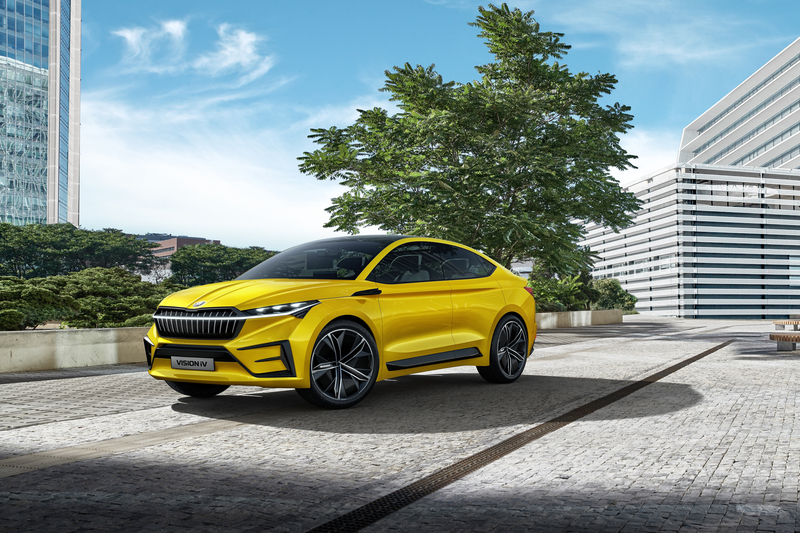 ŠKODA has made visual and technological adaptations to the VISION iV specifically for the Chinese market and equipped it with a 150 kW (204-PS) electric motor at the rear, which drives the rear wheels, produces zero emissions and can deliver a top speed of 160 km/h. The compact lithium-ion battery is embedded in the car’s floor and, with a capacity of 83 kWh, offers a range of up to 500 km. The concept study features plenty of space within its sporty, aerodynamic and emotive body. Other prominent details include illuminated glass inserts in the vertical slats of the ŠKODA grille and cameras instead of classic wing mirrors. The multi-level arrangement of the instrument panel and centre console as well as a seemingly floating central screen add a new dimension to the interior. Innovative technologies provide more safety and comfort; infotainment and digitalisation also mark the beginning of a new era. Smartphones are directly integrated into the infotainment system and can even be used as a digital key for unlocking the car. By introducing the KLEMENT mobility concept, ŠKODA is tracing an arc back to its founding fathers Václav Laurin and Václav Klement – who began the company’s success story by manufacturing bicycles 124 years ago – and is presenting its vision of electric, innovative and modern micromobility for use in China’s metropolises. 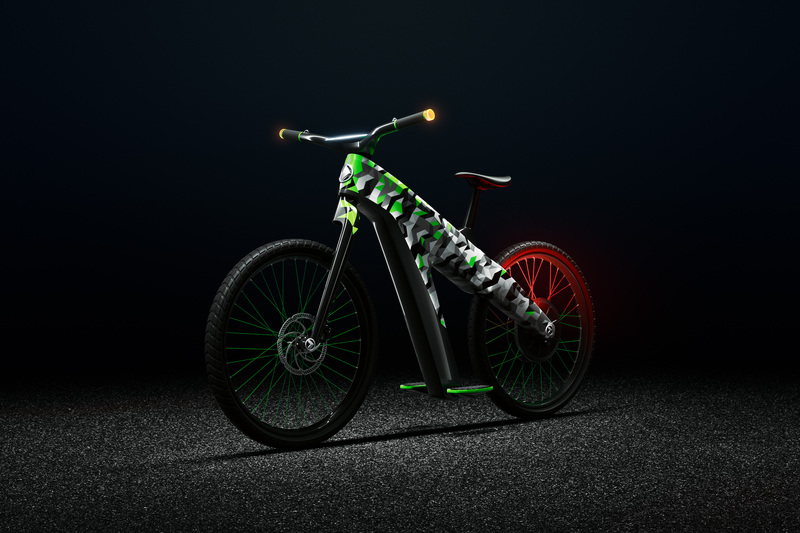 Thanks to an integrated 4-kW rear hub motor, the KLEMENT has a top speed of 45 km/h; the throttle and brake are controlled via innovative pivoting pedals that are child’s play to use. A hydraulic front brake equipped with ABS, and LED lights integrated into the vehicle guarantee a safe ride. China is the only market worldwide in which ŠKODA offers four different SUV models. In addition to the ŠKODA KODIAQ, which is available as a seven-seater if desired, and a ŠKODA KAROQ that is 50 mm longer than its European counterpart, this quartet includes the Chinese version of the ŠKODA KAMIQ and the ŠKODA KODIAQ GT, which were both developed exclusively for China. The ŠKODA KODIAQ marked the beginning of the Czech brand’s SUV campaign and was the first model to display the current design language. 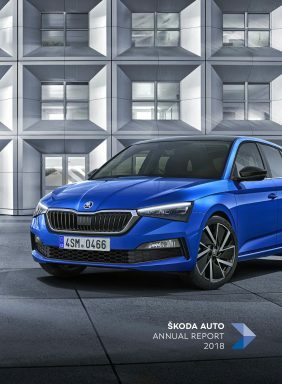 It impresses with the ŠKODA-typical excellent value for money, well-thought-out functionality and generous amount of interior space for up to seven occupants. What’s more, it features a boot capacity of up to 2,065 l – the largest within its segment. Both versions of the KODIAQ offer state-of-the-art connectivity and deliver a power output of 162 kW (220 PS) in their range-topping all-wheel-drive variants. As the brand’s first SUV coupé and boasting a dynamic appearance, state-of-the-art connectivity features and innovative assistance systems, the KODIAQ GT is the brand’s flagship and iconic model. Featuring a sporty as well as stylish exterior and interior, the ŠKODA KODIAQ GT combines the versatility of an SUV with the elegance of a coupé, thereby appealing to lifestyle-oriented customers. The ŠKODA KAROQ in the Chinese market provides even more comfort as the vehicle itself and its wheelbase are both 50 mm longer than in Europe. It features a wealth of assistance systems and tops its segment with its innovative connectivity solutions. The 81 kW (110 PS) variant of the ŠKODA KAMIQ acts as the Czech brand’s entry-level SUV in China and, boasting modern connectivity solutions, is primarily aimed at young, urban customers. One technological highlight is voice command from iFLYTEK, a leading Asian provider of voice recognition technology based on artificial intelligence. The ŠKODA OCTAVIA is celebrating its 60th anniversary since start of production: in January 1959, the first units of this legendary model range rolled off the production line at the Mladá Boleslav plant. It was 60 years ago when the expressive name ‘OCTAVIA’ enriched the ŠKODA brand’s model range for the first time. It was no coincidence that the name was derived from the Latin ‘octavia’, which means ‘the eighth’. After all, the newcomer of the day was the brand’s eighth model after World War II.